I’m currently teaching my children how to create and operate their own blog. This is weird. Nikon D600 – Nikon’s worst “best camera” ever? 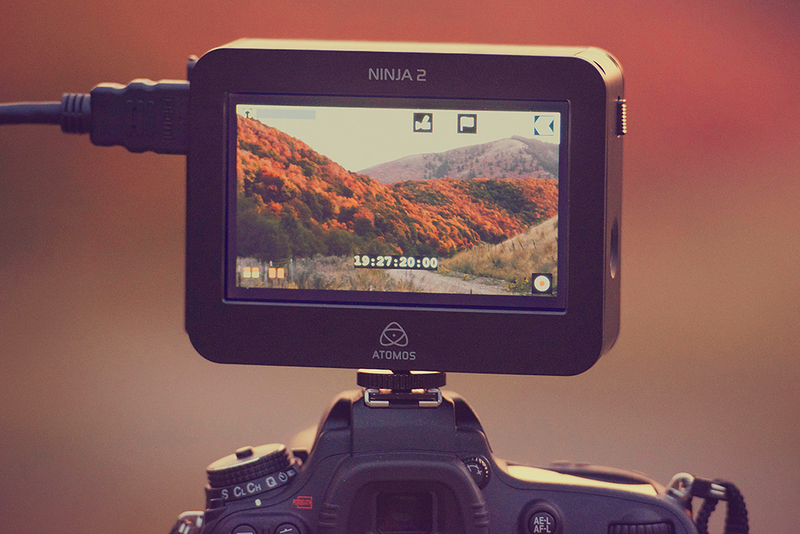 UPDATE 2: Here’s a video of Jeromy Young (the illustrious CEO of Atomos – maker of the Ninja) showing the D600 + Ninja 2 combo working at 100% at Photokina: https://vimeo.com/49862540. Very promising! (Thanks for the links Cheesycam, Herbert & Chris). Looks like I’ve probably just missed something in the setup. I’ll update this post when I know more. UPDATE 3: Atomos and I have been discussing this issue, and it appears there is no current resolution known on their end. Cheesycam noticed that the live view image in Jeromy’s Photokina video was not moving, and thus not actually being fed from the D600. It was a mistake on my part to assume the unit he had was working properly. At this point I would suggest that we all reach out to Nikon and inundate them with requests for a fix to the 95% output size problem and the live-vew aperture problem ASAP. Otherwise, this camera makes a lot less sense for a second shooter (at its current price point) in video work. UPS just pulled up and dropped off a brand new D600 — the greatest thing since the D800. I have to say, right out of the box, the camera looks and feels like a precision machine. Nikon really pulled out all the stops on this “budget camera”, at least on the surface. Even in the IQ department, it seems they have outdone themselves. And of course, being a hybrid photo/video shooter (more than ever these days), I was thrilled to have a third option in Nikon’s lineup for a serious VSLR. 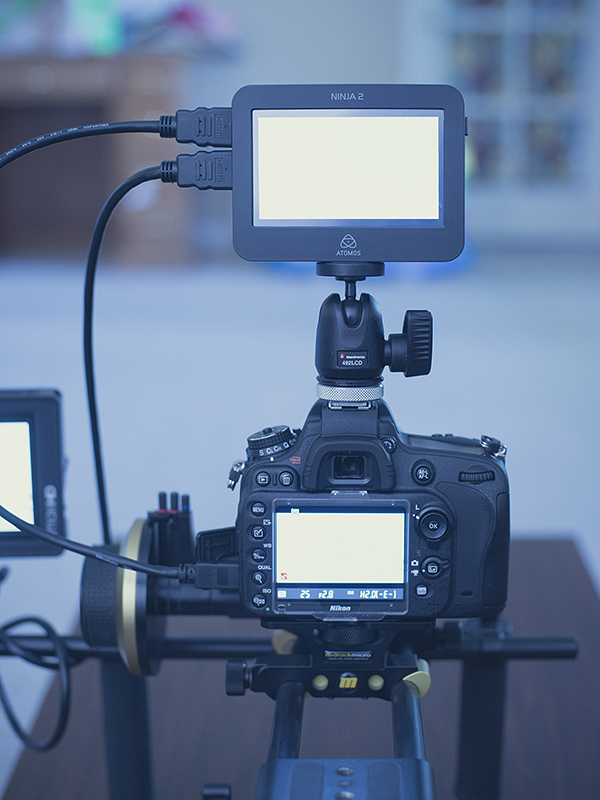 I was very pleased to hear at the time of the announcement that the camera supports uncompressed HDMI out just like the D800. So, you can imagine my horror (and surprise) when, after diving into all the settings, I connect my D600 to the Ninja 2 and see a black frame around the entire frame. What?!?! 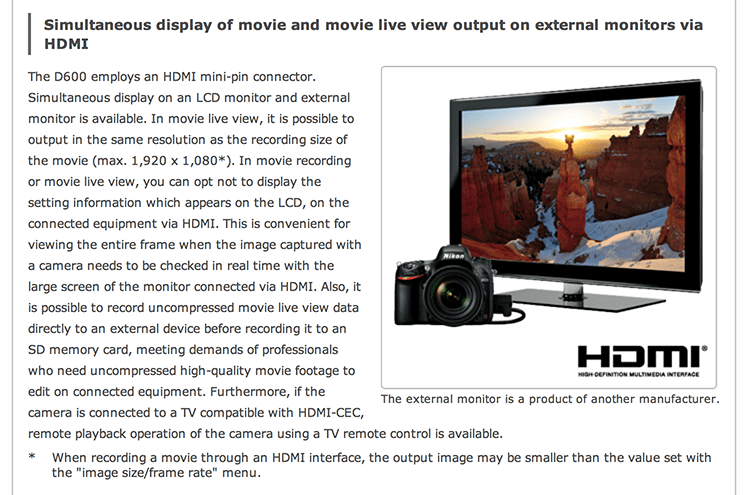 Could it be that they REALLY only offer 95% display output size, and not the 100% output size found on the D800 and D4? At first blush it appears so. I cannot find anything online to contradict this conclusion, and certainly can’t see anything in the settings (nor in the manual) that offer a fix. I would hate to think this is nothing more than Nikon crippling this body so it doesn’t “cannibalize” their D800 sales – that could very well qualify this as Nikon’s worst “best camera” ever. 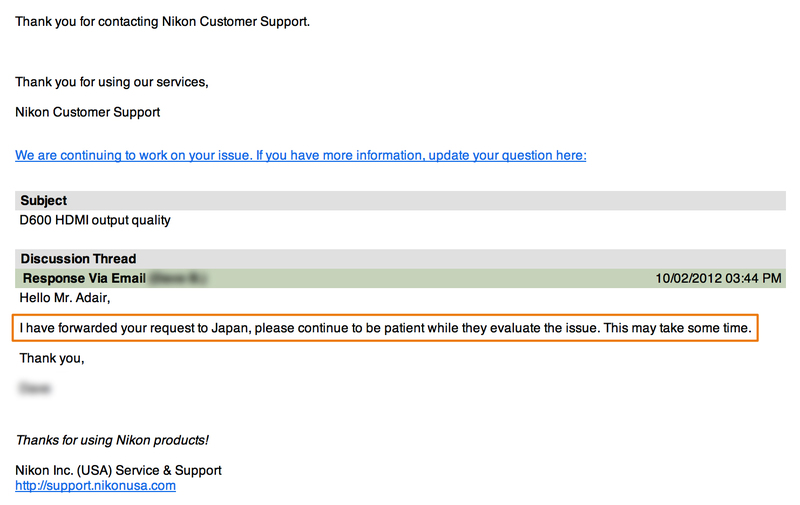 I hope it’s simply an oversight (or a bug), as it is a detail they should be making VERY clear for users BEFORE they drop $2k+ on Nikon’s latest camera. I’ll keep digging around and see if I can prove myself wrong. I’m hoping I can, because if so, this camera could be an amazing thing. 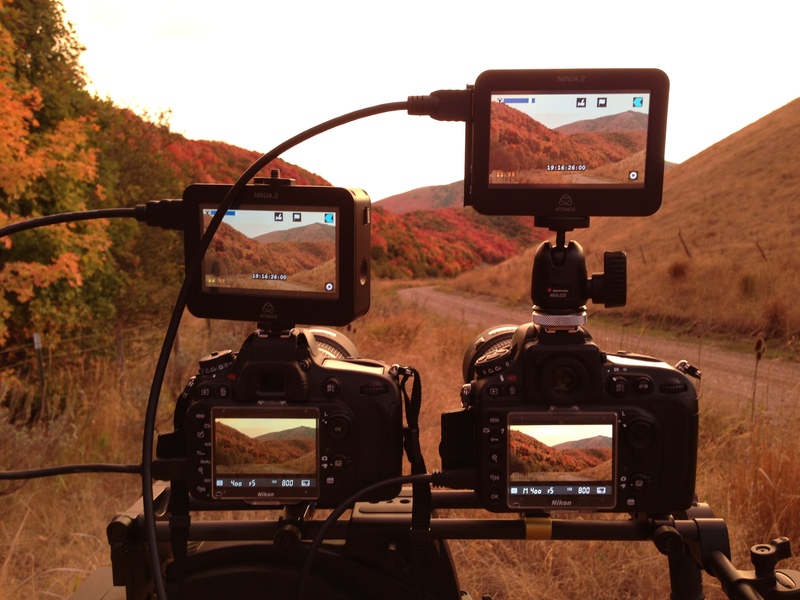 Do you have the D600 and an external recording device such as the Ninja? If so, what has your experience been like? See those black bars around the perimeter of the Ninja screen? Not a pretty sight at all! Well, the time has come once again when Nikon has opened up its treasure chest and pulled out another treat for photographer-filmmakers everywhere. And what have the gear gods delivered this time? None other than the much anticipated Nikon D600, a compact little 24-megapixel full-framed (FX) camera body that seems to be in a class of its own. It seems safe to assume this camera is carving out an entirely new spot in Nikon’s lineup, much like the D700 did four years ago. 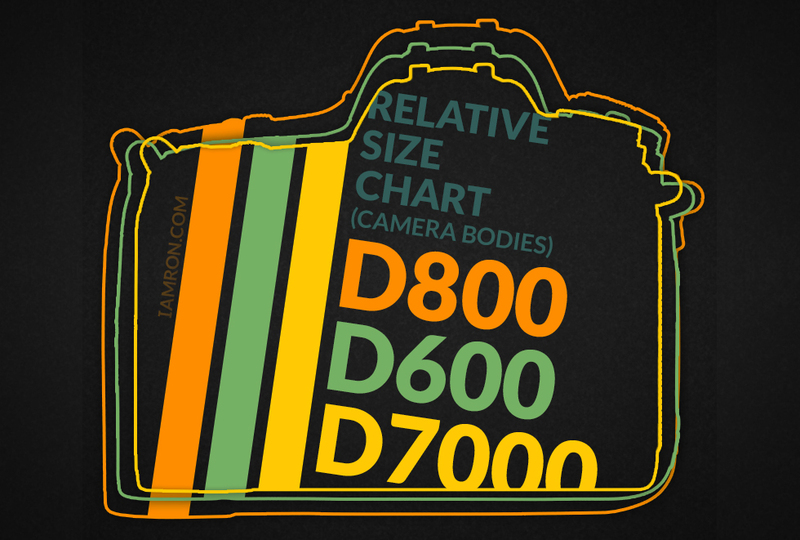 In the meantime, check out this little chart I worked up showing the differences in body size between the D7000, the D600, and the D800. Feel free to pass it around or re-post as you see fit. 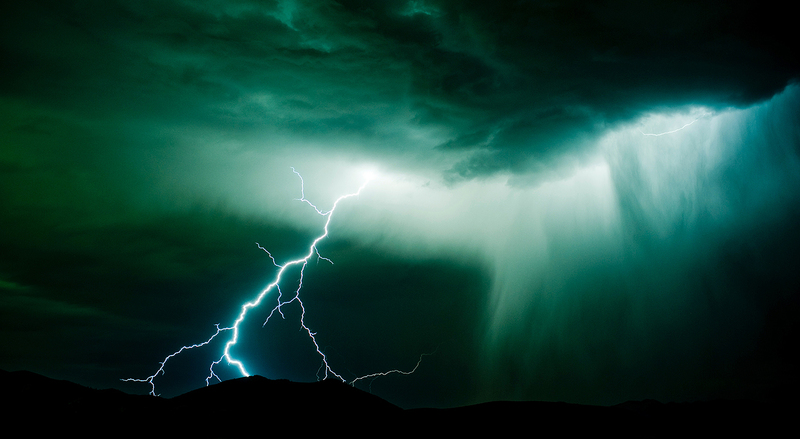 Are you carrying your CLR (Concealed Lightning Rod)? In the past 12 hours, I’ve twice heard the argument that the act of carrying a firearm as a precautionary measure against some violent attack such as a mass shooting is foolish unless I’m also going to carry a lightning rod to protect against the much more likely lightning strike. One of the arguments were made to me (by a friend) in person, and I laughed. They weren’t joking. The second was made on a news site (by a commenter) in conversation about an article detailing the moves by some states to create more restrictive gun laws in the wake of the Colorado theater shooting. And it got me thinking. Here’s how it went down (with some back-commentary in the same thread). James Holmes also purchased a very large amount of illegal explosives. Don’t you think he could have purchased illegal firearms if he’d wanted to? These new laws will do nothing but make it even more difficult for law abiding citizens to protect themselves. “Protect yourselves from what? The odds of you being involved in a gun crime are practically nil. You have a better chance of getting killed in a car wreck or getting stuck by lightning. Does that mean you need a howitzer on your car to protect yourself from other drivers or a lightning rod to protect yourself from storms? Sounds silly, but it would make more sense to own those two things for protection than it would to own a gun. And you are right, you are not a criminal by having a gun. The bad thing is, that as soon as people find out that you are concealing one, however legal it may be, people will treat you like a criminal. Even open carry guys get harassed by the cops, despite being fully within their rights. It frightens people, causes tension, and that is when stupid, avoidable mistakes happen. Let me get this straight: on one hand these lightning-rod-salesmen are arguing that it is foolish to arm myself with the proper tools to reasonably protect myself and other innocent people against an unknown assailant, but on the other hand it’s ok for a nation full of ignorant fear-mongers to overreact and legislate an issue to death which, by their own confession, isn’t even a statistical blip? So in an effort to thwart this virtual non-threat, self-reliance and personal preparedness are inferior to legislation (fueled by ignorance and overreaction) that would strip individuals of our inalienable rights to self-defense? Do these people realize how insane that sounds? More guns do indeed equal less crime. If you don’t believe me, take a look at the reported number of violent crimes that occur each and every year in the UK (an anti-gun country) compared to the US. Compared to our average American city, a resident in the UK is TEN TIMES MORE LIKELY to experience violent crimes per-capita than an American. UK residents are TEN TIMES more likely to get mugged, raped, burglarized, beaten, killed, robbed, kidnapped, held hostage, etc. than we are. Compared to our most violent cities (which, by the way just HAPPEN to be the cities with the most restrictive gun laws), the UK is still more violent by three (or more) times. That means our wives, our daughters, our sons, our parents, our grandparents — all of them are more vulnerable because these “weather men” opted to give up one of the most vital tools we now have available to us: the right to self-defense. If these illogicians think a magical happy-go-lucky modern utopia is the result of getting rid of guns, then they are ignoring the basic law of cause and effect. 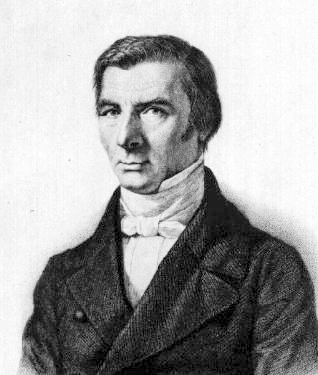 I implore everyone in this country to study Frederic Bastiat on the key differences between a good economist and a poor one. It will greatly benefit the life of anyone who is sincerely seeking truth. Here I am thinking it’s kind of lame that I sign up for an account near the end of a woot! deal, only for your system to tell me (once I enter all of my info after multiple subsequent page loads and an exhausting exercise in speed-typing data-entry) that the deal is over, despite the fact that I began signing up LITERALLY less than 1 minute before it expired (the website said I could get the deal for the next minute). So, now I’ve decided I’d rather not deal with a company that ropes me in to things without being forthright, and lo and behold, what do you know? I can’t delete my account. Please. Delete my account now. By the way, 1999 called and they want their backwards “customer-retention” philosophies returned promptly. They’re running out of bozos to bankroll the tech-boom bubble. What, no witty reply to my charming banter? I guess that voice is reserved for the stuff they’re trying to hock on the cheap. Shucks. Last month my family and I had the opportunity to visit the home of some good friends (I’ll refer to them as the “Smiths” hereafter). What started as a friendly conversation quickly degraded into a spirited debate on education vs. compulsory schooling. Our family shares a great deal of respect for the Smiths, and we see eye-to-eye on quite a few topics, but one topic on which we have long differed is that of education. While the Smiths are far from evangelists touting the virtues of a public compulsory school system (one which is clearly failing to satisfy society’s needs let alone meet the minimum criteria of what constitutes a successful education) they do have a healthy appetite for the “fringe benefits” of the public system and the value it brings students and families when compared against the absence of such a system. Now, I don’t want to sound like I’m merely blaming the world for my woes. In fact, I am the first to admit that I’m as guilty as the rest of us in many ways, bestowing the burden of compulsion upon my own children, friends, acquaintances, and even myself. I, too, suffer from a lack of imagination, if only to a lesser degree. I’m not fighting the war against compulsion out of sense of superiority. I do it precisely because I recognize my own inferiority against this principle which I so despise. As is the case when overcoming any great challenge, I’ve found myself investing a great deal of time pursuing an education on the matter. It has begun with a sizable investment of my conscious thought and observation into the matter of education and compulsion over the past decade or more. I’ve also done a bit of “light reading” on the matter, and will no doubt be sharing those resources here as time goes on. The debate that accompanied our visit to the Smith’s home last month was stirring for me. So stirring, in fact, that I decided to write a letter to them in an attempt express the many things that were not communicated (or were communicated poorly) that evening. I realized there were some key principles at the foundation of my views that weren’t even discussed. I can see how, in lieu of these basic building blocks, confusion and skepticism might abound. And so it was that I decided to write a letter to the Smiths in an attempt to clearly outline the foundation of my views. If this is indeed a true, universal principle, adherence to it will no doubt vary from individual to individual, family to family, and society to society. 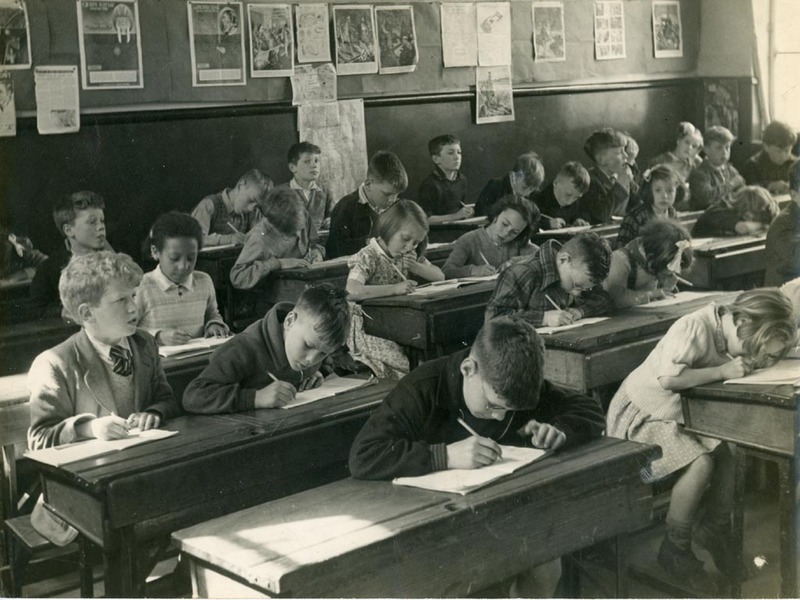 However, one important distinction will exist: we will cease liberal peppering of force and compulsion in the rearing and tutelage of our young minds. I publish this letter here today because it has become clear to me over the last month that this is more than a simple communique to the Smith family. This is, more or less, my manifesto on the principle of the agency of man. This “manifesto” is certainly far from exhaustive. However, I post it here with the hope that I will either be proven irrefutably wrong in my faulty beliefs, or so the discussion can flourish and develop into real change. Either way, I want to know whether the arguments in this document are efficacious, or merely fallacy. The conversations I’ve already shared with those who have read this have been amazing, and extremely enlightening. So I invite you to read this, pass it along, add to it, comment on it, and let me know if it has had any impact in your life, good or bad. I have felt for some time that this is a conversation we need to have in this crazy world, especially today. Posting this here as a reference for a near-future project we’re working on. 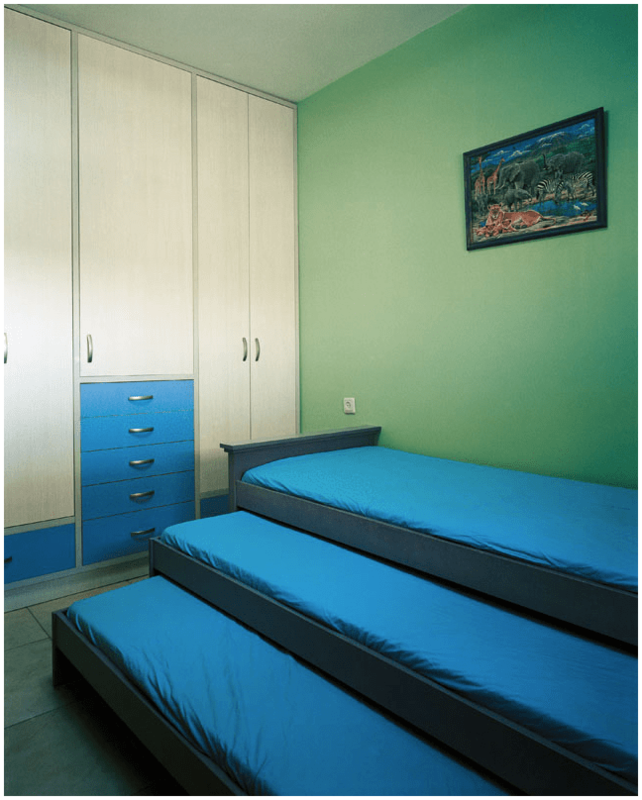 Space saving beds, 3-in-1. From James Mollison’s fantastic book “Where Children Sleep“. Only the educated would read this. My guess is it will go unread. “In all times, but more especially of late years, attempts have been made to extend wealth by the extension of credit. “I believe it is no exaggeration to say, that since the revolution of February, the Parisian presses have issued more than 10,000 pamphlets, crying up this solution of the social problem. The only basis, alas! of this solution, is an optical delusion – if, indeed, an optical delusion can be called a basis at all. “The first thing done is to confuse cash with produce, then paper money with cash; and from these two confusions it is pretended that a reality can be drawn. “It is absolutely necessary in this question to forget money, coin, bills, and the other instruments by means of which productions pass from hand to hand; our business is with the productions themselves, which are the real objects of the loan; for when a farmer borrows fifty francs to buy a plough, it is not, in reality, the fifty francs which are lent to him, but the plough: and when a merchant borrows 20,000 francs to purchase a house, it is not the 20,000 francs which he owes, but the house. Money only appears for the sake of facilitating the arrangements between the parties. “Peter may not be disposed to lend his plough, but James may be willing to lend his money. What does William do in this case? He borrows money of James, and with this money he buys the plough of Peter. “But, in point of fact, no one borrows money for the sake of the money itself; money is only the medium by which to obtain possession of productions. Now, it is impossible in any country to transmit from one person to another more productions than that country contains. “Whatever may be the amount of cash and of paper which is in circulation, the whole of the borrowers cannot receive more ploughs, houses, tools, and supplies of raw material, than the lenders altogether can furnish; for we must take care not to forget, that every borrower supposes a lender, and that what is once borrowed implies a loan. “This granted, what advantage is there in institutions of credit? It is, that they facilitate, between borrowers and lenders, the means of finding and treating with each other; but it is not in their power to cause an instantaneous increase of the things to be borrowed and lent. And yet they ought to be able to do so, if the aim of the reformers is to be attained, since they aspire to nothing less than to place ploughs, houses, tools, and provisions in the hands of all those who desire them. “And how do they intend to effect this? “By making the State security for the loan. “Let us try and fathom the subject, for it contains something which is seen, and also something which is not seen. We must endeavour to look at both. “We will suppose that there is but one plough in the world, and that two farmers apply for it. “Peter is the possessor of the only plough which is to be had in France; John and James wish to borrow it. John, by his honesty, his property, and good reputation, offers security. He inspires confidence; he has credit. James inspires little or no confidence. It naturally happens that Peter lends his plough to John. “But now, according to the Socialist plan, the State interferes, and says to Peter, “Lend your plough to James, I will be security for its return, and this security will be better than that of John, for he has no one to be responsible for him but himself; and I, although it is true that I have nothing, dispose of the fortune of the taxpayers, and it is with their money that, in case of need, I shall pay you the principal and interest.” Consequently, Peter lends his plough to James: this is what is seen. “Indeed, gentlemen, it is no such thing; it is no advantage to the nation, for there is something behind which is not seen. “It is not seen, that the plough is in the hands of James, only because it is not in those of John. “It is not seen, that if James farms instead of digging, John will be reduced to the necessity of digging instead of farming. “That, consequently, what was considered an increase of loan, is nothing but a displacement of loan. Besides, it is not seen that this displacement implies two acts of deep injustice. “It is an injustice to John, who, after having deserved and obtained credit by his honesty and activity, sees himself robbed of it. “It is an injustice to the tax-payers, who are made to pay a debt which is no concern of theirs. “Will any one say, that Government offers the same facilities to John as it does to James? But as there is only one plough to be had, two cannot be lent. The argument always maintains that, thanks to the intervention of the State, more will be borrowed than there are things to be lent; for the plough represents here the bulk of available capitals. “It is true, I have reduced the operation to the most simple expression of it, but if you submit the most complicated Government institutions of credit to the same test, you will be convinced that they can have but on result; viz., to displace credit, not to augment it. In one country, and in a given time, there is only a certain amount of capital available, and all are employed. In guaranteeing the non-payers, the State may, indeed, increase the number of borrowers, and thus raise the rate of interest (always to the prejudice of the tax-payer), but it has no power to increase the number of lenders, and the importance of the total of the loans.